Good Sleep Health and Sleep Apnea – Tomorrow! Speaker: Jess Lackey of Pacific Pulmonary Inc.
“Our Better Breathers support group encompasses community members and their caregivers who live with chronic respiratory disease and lung disease. Better Breathers is designed to provide support, education, networking, and tools to improve the daily lives of those living with these health conditions. We welcome any community member with asthma, emphysema, chronic bronchitis, sarcoidosis, asbestosis, pulmonary hypertension, pulmonary fibrosis and the many more lung diseases affecting our population, pediatric or adult. 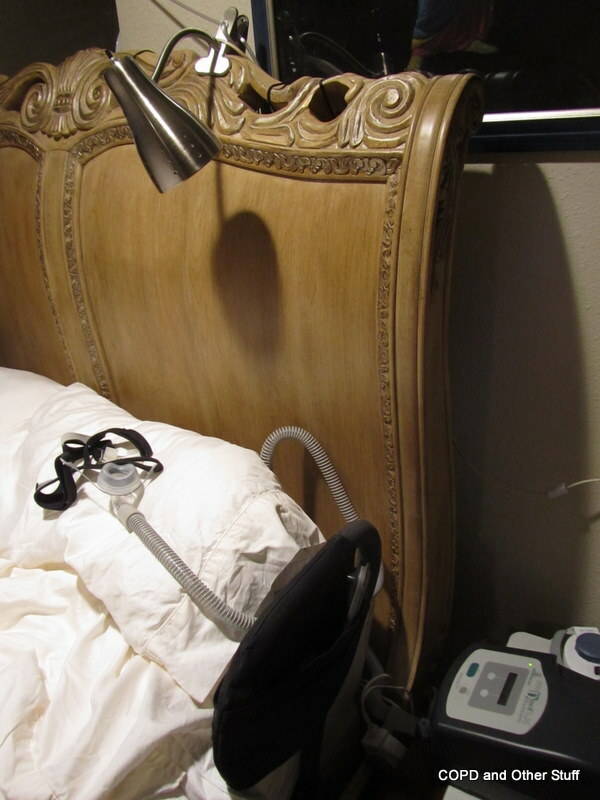 My sleep apnea story in short form: Some ten years ago the Sleep Study and bi-pap machine enabled me to get back into a bed after a few years of sleeping in a chair…I could not breathe lying down so had to sleep in a recliner chair…comfortable though it was, it was not a bed. During this last year after an at home study I discovered my saturation numbers hit the basement while sleeping – bottoming out into the low 70’s. 100 is normal and nobody knew it…who knows how long that went on? During sleep how low can the blood/oxygen levels go and for how long before brain cells die? Personally, I want to hug and cherish my brain cells from a distance and keep them going as long as possible. 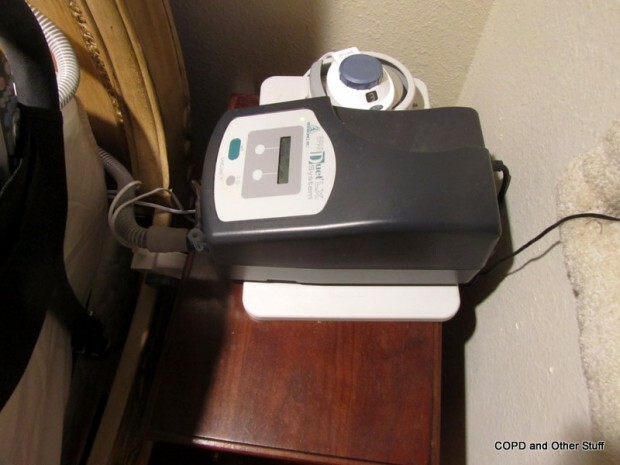 A sharp Harrison Medical Center ER doc caught a problem and had me put on a concentrator that gathers oxygen from the room and bleeds it into my bi-pap – leading to better sleep. Except when the RLS bounces me right out of bed to move my legs and walk around. 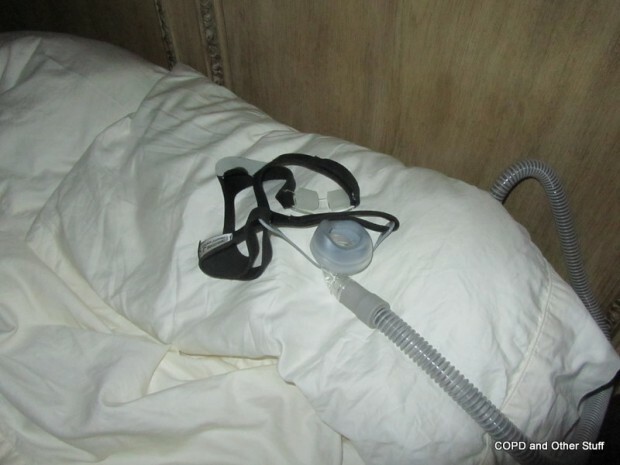 Ignoring Sleep Apnea can lead to serious stuff – we need to be aware. Tomorrow is the opportunity to ask the questions and have fun at the same time. See you Wednesday! If anyone needs a ride, let me know. 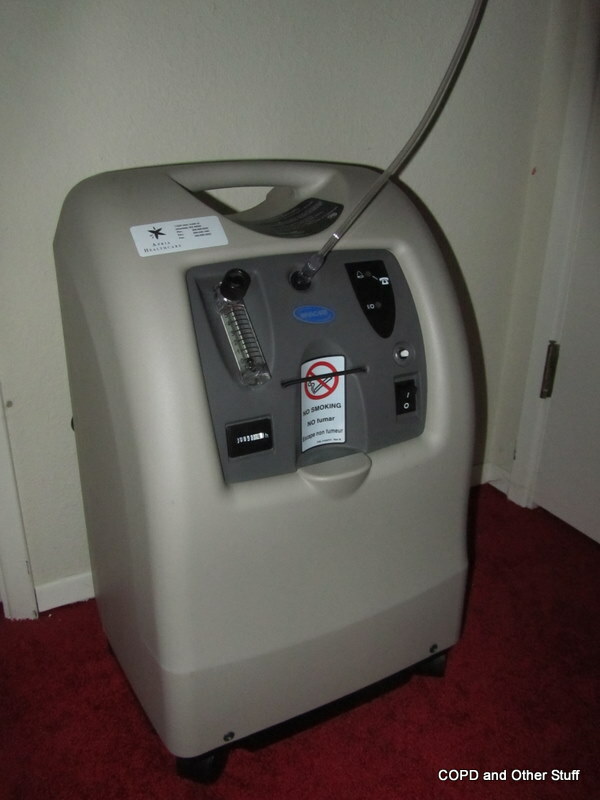 Following are photos of my concentrator connected to the bi-pap and connected to the facemask that goes over my nose and blows air into my airway. Some folks say the c-pap and bi-pap is too noisy. I call it the sweet song of life. A New Study for COPDers: Mechanism of Greater Oxygen Desaturation during Walking Compared with Cycling in COPD. Do COPDers desaturate more walking than they do cycling? I’ve said ever since I discovered the recumbent trike existed that the recumbent trike was God’s gift to the COPDer…indeed, anyone with physical limitations. Pedaling around the bay from the ferry on Whidbey Island with the American Lung Association of Washington’s Trek Tri Island three day cycling trip one early morning a few years ago was the first time I felt ‘normal’ again in about 7 years and the same length of time I’d gone anywhere overnight since a stay in Harrison Medical Center in 1997. In those days I didn’t have a hip problem so I could walk without a problem other than shortness of breath but the recumbent trike lets us take our comfortable seat everywhere we pedal and stop whenever we need to take a break. It also builds the legs muscles better and faster (my opinion) than walking and it is sure more fun and faster. My point is wondering what the following study means in practical terms – to us, the patient. I am one of those who do not desaturate enough for oxygen while awake. Is cycling less strain or easier on our lungs than walking? Mechanism of Greater Oxygen Desaturation during Walking Compared with Cycling in COPD. Mahler DA, Gifford AH, Waterman LA, Ward J, Machala S, Baird JC. 1 Section of Pulmonary & Critical Care Medicine Dartmouth Medical School, Lebanon, NH, USA. BACKGROUND: Patients with chronic obstructive pulmonary disease (COPD) exhibit greater oxyhemoglobin desaturation during walking than with cycling. The purpose of this investigation was to investigate differences in ventilatory responses and gas exchange as proposed mechanisms for this observation. METHODS: Arterial blood gases and lactate were measured in 12 patients with COPD (age, 68 ± 6 years) during incremental treadmill and cycle exercise. The primary outcome to assess the ventilatory response to exercise was the partial pressure of alveolar oxygen (P(A)O(2)). The primary outcome to assess impairment in exercise gas exchange was the difference between partial pressures of alveolar and arterial oxygen (P(a)O(2)) (AaPO(2)). RESULTS: P(a)O(2) was significantly lower at peak exercise for treadmill walking (51.4 ± 6.8 mmHg) compared with cycling (60.4 ± 10.7 mmHg) (p = 0.002). The initial increase in P(A)O(2) with cycling occurred prior to the onset of the anaerobic threshold. At peak exercise, P(A)O(2) was significantly higher with cycling compared with walking (p = 0.004). The anaerobic threshold occurred at a lower VO(2) during cycling than walking (p = 0.001), and peak lactate levels were higher with cycling (p = 0.019). With progressive exercise, AaPO(2) increased similarly during treadmill and cycle exercise. I do not have a financial interest in any bike company including the recumbent trike. We live in earthquake country. We’ve jellied to varying degrees in the past and no doubt will again in the future. So far we haven’t had a quake over magnitude 7.0 and that was in 1949. More jelly jiggles and Shake, Rattle and Roll are in store for Kitsap County and surrounds. What are we doing to prepare to take care of ourselves at least 72 hours? Another quake or natural disaster – such as the last freeze and two day power outage in Silverdale is coming. I don’t want to repeat the last one where everything we counted on, failed, including the generator and we lived inside where the temperature dropped to 40 degrees over the two days without heat or bi-pap and concentrator. Kitsap County-area historical earthquake activity is slightly above Washington state average. It is 235% greater than the overall U.S. average. A few key points from the outstanding and powerful program put on by Pamela O’Flynn, RRT, MBA Respiratory Care Department, Harrison Medical Center and the American Lung Association’s, Better Breathers (BB) caught my attention. For a super reference booklet – get the 12-month Preparedness Calendar for the full story. Contact your local hotels/motels for their pet policy. Next time, should the generator fail us again, we’ll pack up the dogs and head for a dog friendly hotel and drag the bi-pap and concentrator along. We were told to pack what we generally eat for our 72 hour Comfort Kit – the total opposite of what I used to pack and take in the mountains during the old horse packing and hiking years. Food that was lightweight, easy to cook and nutritious for the weight was key in what I chose for such trips…not necessarily what I ate at home. The difference will show up in our bodily functions – “Eat what the body is used to…” And the interesting Poo Bags were mentioned. Waste bag pre-loaded with Poo Powder gelling deodorizing agent. I bought mine online at REI, but they are probably sold locally at any of the sports stores. Our homes should be earthquake proofed including anchoring furniture to the walls. Laura Jull, CEM, CHSP, Emergency Preparedness Coordinator at Harrison Medical Center, uses Museum Wax to anchor down small items to the shelf. 600 thousand pets were never found or missing after Katrina – no one was prepared for the magnitude of the storm. 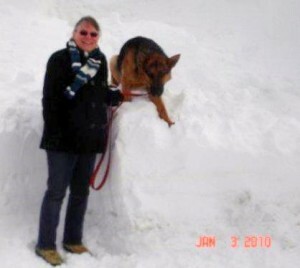 A lesson learned there carries over here…and provisions are being made for our pets in case of a disaster. For those on oxygen, bi-pap, c-pap or concentrators, register to be on a Special Needs list and shelter. Contact the Fire Department and get on the Power Company list. Contact your Oxygen Company and ask what provisions they have in place for their clients during a disaster. Sheriff Boyer is Kitsap County’s emergency coordinator – I hope he/department will see Pam’s Katrina slide presentation and get her viewpoints based on her real life experiences working in a hospital so badly affected during and after Katrina – as were they all badly affected. Her hard earned insight should prove helpful for that day coming in our future….in my opinion. Greetings: What I thought would be an easy chat about the need for patients to prepare for a natural disaster has turned out quite the opposite and it won’t be done in one blog post. This is part One of Two. Kitsap County got lucky. Pamela O’Flynn, RRT, MBA Respiratory Care Department Director, Harrison Medical Center has firsthand experience what happens when we’re not prepared for a disaster. She is a whirlwind force fighting to get all of us prepared as best we can – NOW. Harrison Respiratory Center’s Emergency Preparedness meeting on Wednesday, 19 January was the most intense learning experience I’ve had in years. We alternated tears, laughter, even giggles when Pam tried to look disheveled as she shuffled along the wall demonstrating how the exhausted medical staff moved and worked during the Katrina natural disaster and the weeks and months following the good, bad and ugly aftermath of a storm and disaster no one was prepared for as Pam, along with others, lost her home 40 miles inland from the hurricane storm surge. The good was the bonding of the medical staff and all who worked for the common cause of helping others without supplies to do it. We sat shocked, saddened and teary as Pam described why Emergency Preparedness was vital for our survival here and briefly described how, during the horrific Katrina disaster they were not prepared for the scope of the disaster. Pam described how oxygen patients came to the hospital asking for oxygen and she was forced to turn them away knowing their fate without it. The hospital ran out of what they had…no one was prepared…they didn’t know anything could turn out so badly. They learned from it and that experience will help us here, now. We got firsthand glimpses of a hospital and medical providers under siege and unimaginable duress. On the flip side we got glimpses of powerful bonds forged out of desperate need and innovative creative means to help patients. Contact respiratorycare@harrisonmedical.org for the packets and specific information. Following are a few photos. Hopefully my desktop will work smoothly from here on out – thanks to my husband, the Old Guy. He spent the past two days trying to get it to work. Alec is the flip side of the dancing COPDer you see in the television commercial. For the COPD TV commercial dancer, all it takes is one inhaler, a few puffs and like magic, the lungs are okay and off to the dance floor. Alec is a COPDer on oxygen, living right here in Kitsap County. .Alec doesn’t dance, he is barely able to walk. The other day he walked for less than two minutes before he was exhausted and had to sit down. He has a doctor appointment with his primary in the next week or two and wonders if he can get strong enough by then to make the appointment. When he called for an appointment with a lung specialist in town, he was told that he missed five appointments during the past twelve months and she wouldn’t give him another appointment. Ouch. I can relate to missed and late appointments with my doctors. None, so far, has refused to give me another appointment. My phone rang last week and a man asked for me by name. He gave his name and went on to say he had gotten my name and phone number from a article Chris Henry wrote one month short of five years ago. 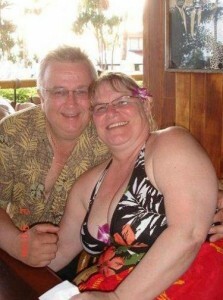 The article mentioned physical fitness and EFFORTS, my online support group. I told him about the years I wasted not knowing what I could do to help myself. It wasn’t until I found EFFORTS (Emphysema Foundation For Our Right To Survive) online and learned to go BEYOND my shortness of breath to gain strength and muscle that life began again. I encouraged Alec to begin rehab to get strength back and talk with the doctor he has a good relationship with to begin a team effort to regain as much muscle and fitness possible,..unless there is some medical reason he cannot exercise. Alec didn’t know about Pursed Lip Breathing, the oximeter, none of the basic tools COPDers NEED to be the best we can be for the best quality life possible. He has not seen a doctor for his oxygen use in a year!. We exchanged email addresses and this is where I became aware of unintentional gross neglect of a COPDer by not educating him in the most basic how to PLB breathe! He didn’t know why a COPDer has to exhale twice as long as he inhaled! Why not? How many other folks do we have in Kitsap County, feeling alone and trapped without knowledge and encouragement to work toward a better quality life? I’m guessing Alec is the tip of the iceberg of ignored people right here who need help! COPD can be a gradually isolating disease. I suggested he join ‘Walkers’ on EFFORTS, contact the American Lung Association of Washington and the Shortness of Breath Self-Management Study at the University of Washington. Following are emails I exchanged with Alec and his permission to use here. Hi Sharon..I contacted my doctor’s office, although he was off, and the nurse said go ahead and keep my appointment and discuss with him about being my medical partner in my quest with EFFORTS. Hope you are doing well. Good morning Sharon….I am having a tough day today and have become discouraged ,a little. I thought I would exercise by walking slowly as many minutes as I could..If I didn’t have my faith in God, I don’t know where I would be! I started walking and realized just how bad of shape I’m in. I couldn’t make it 2 minutes ,with my 02 !!. Then I realized I hadn’t prayed or eaten or anything….and that’s not like me. So I prayed and ate and started again. I could barely make it over 2 minutes walking slowly. I realize you probably don’t want to hear all this, but I will leave you alone after this. I have a week from tomorrow to get in some kind of physical shape to make it to the my doctor’s appointment. I do want a better quality life. You have given me the inspiration to do that. I didn’t have much luck finding an exercise regimen on EFFORTS, so I will look on ALA for some ideas. I am going to keep moving forward no matter what happens, even if they are slow, or as you put it, one foot in front of the other! I just get down sometimes, but my God always picks me up and says…keep your eyes on Me, not your circumstances.. I’m sorry to unload all this on you, but I won’t bother you anymore. I will continue today to increase my minutes. Thanks for listening…..
…..call 911! Or your doc. No one should be in the kind of shape you mention and by yourself…no one! Sharon…I’m okay if I’m sitting down and not walking for a lengthy period.I don’t believe I need 911, as I breathe okay if I’m not walking or exercising.I’ll be okay.I think it sounded worse than it is! I’m alright! Please don’t worry yourself. Believe me, I know when I need 911……..Please…I’m so sorry I startled you ……. Alec…Thank you for sharing with me. I’m astounded that no one has helped you build muscle and that you are alone through this and I wonder how many more of us are out ‘there’ that are in the same boat? We need to help each other with encouragement … will you give me permission to use this email exchange (I won’t use your name)to emphasize the NEED for education for COPDers in my blog? We’ll do it together, Alec…okay? AND, one day, you’ll be riding a recumbent trike…one step at a time, one cycle wheel turn at a time and have fun too. God has a sense of humor, I am convinced of it. Do you have a goldfish, bird, birdfeeder…any pets? Yes, you are right Sharon. God is in control and has a sense of humor! There’s never been a doubt in my mind about that. I didn’t know you would get so worked up about it or I wouldn’t have e-mailed you. I’ve been here for over 4 yrs. by myself! I had a dog, but he got attacked by raccoons and had to be put down. I still cry about that one! Malcom. Great dog. Half Akita, half Spaniel. Big! He was 12 and had a hole tore in his throat by the raccoons over some dog food. Malcom stood his ground, but it cost him his life. Reminds me of ….yea….Jesus! The Vet said he could patch him up, but he was 12 and bigger dogs don’t live as long as smaller ones. He said he probably wouldn’t last long if he couldn’t eat. He couldn’t get up to eat. It was all so sad. I called the Humane Society and they came and carried him away. I’ll never forget the look in his eyes. But I’ll see him again when I join him in heaven.But it still hurts.Poster Child? Never considered myself one of those. I don’t want to lose what little freedom I have. Can you understand that? I hope so! If I told people just how bad I was they would freak out.We do need education in the rehab area. People caring about other people! My family lives out of state and I hate to ask someone to call me everyday or drop by because they all have families, except Louis, and he’s very busy at the church.My goal is to get healthy enough to ride my recumbent bike, go to church, prayer warrior’s on Thursdays, and to go and tell people how much their God loves them! Not to much to ask is it? Nothing is to big for God! I can do all things through Christ who strengthens me! I am going off-line to read my Bible and study. So I’ll talk to you later.One step at a time…you’re right. And fun….I used to love to swim. Couldn’t get me out of the water in the summer. You are a dear, with a big heart. Talk to you later…..Blessings……. The following article provides a good reason why COPDers tend to have panic attacks as they get more and more short of breath…. 1. Education and rehabilitation for the COPDer. 2. Find the COPDers like Alex…let them know they are not alone and what they can do to help themselves to a more active life. 3. We can help each other if for nothing else but a cheery “Hi, How are you?” voice on the phone. World COPD Day Celebration 2009 is coming to Silverdale! WORLD COPD DAY CELEBRATION 2009 is tomorrow! The University of Washington’s School of Nursing, Pam Wiseman is the speaker and will be in Silverdale, Wednesday, 18 November 2009 to speak in honor of World COPD Day. The Shortness of Breath subject will include discussion on strategies on what we can do to help ourselves lead a quality life with COPD. Pursed lip breathing, exercising and all the questions you can think to ask are included. We will get answers to what we can do to best help ourselves lead the best quality of life possible and help us remain the Captain of our own lifeship. Knowing these strategies can and will make a difference in our lives. Caregivers, family and friends are welcome. I am a COPDer and fan of the recumbent trike as a superb way for us to exercise; gain muscle for optimal ability to breathe….since muscle utilizes oxygen better than flab. I will bring one of my trikes tomorrow if anyone is interested and please note that I do not sell recumbent trikes nor benefit from anyone else selling them. If COPD has a living guru in this nation, it is Thomas L. Petty, MD. The following message is important and can save lives through early detection. Dr. Tom’s comment, “COPD is associated with numerous co-morbidities, and indeed, the entire body may become involved” is spot on….believe it… YES! Since COPD diagnosis, then landing in the hospital in 1997, I have gone from being healthy and fit into my fifties to COPD and another EIGHT medical conditions. Each has its own set of ‘rules’. If I take pain pills for the Cellulites, I know that my respiratory system will be adversely affected….not a good thing with two lung diseases. The latest medication, Diovan, adds to the mix. The point is that a COPD diagnosis is only the beginning of a medical adventure that need not happen with early detection…the simple Spirometry test. Please, read Dr. Tom’s comments. In the four decades I’ve devoted to lung health, chronic obstructive pulmonary disease has been slow to excite the practicing physician. Yet COPD should create great enthusiasm because we have made so many advances in identification and treatment. Many new therapies are available that are effective and favorably influence the disease. COPD is associated with numerous co-morbidities, and indeed, the entire body may become involved.1It is now regarded as a systemic disease.2Traditionally; COPD has included emphysema (loss of alveolar walls and loss of elastic recoil), chronic bronchitis, inflammation in the small and large airways, and various degrees of lung inflammation throughout the lung parenchyma. More recently, bronchiectasis has been added to this spectrum, although there are significant differences in manifestations and pathogenesis with repeated bacterial infections playing a more prominent role in bronchiectasis than with emphysema and chronic bronchitis. COPD is characterized by irreversible airflow obstruction as judged by simple spirometry. Only the FEV1is needed to judge the severity of airflow obstruction, although a number of other measurements of airflow volume and gas transfer (diffusion test) are commonly undertaken to assess the disease states in more detail. 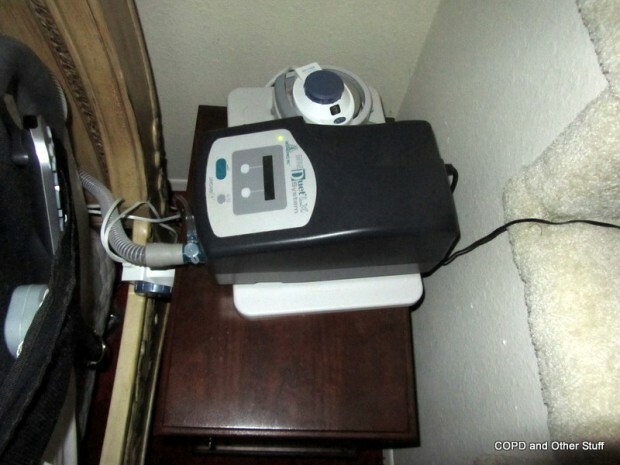 Spirometry is used to monitor the course of disease. All physicians who treat COPD should have immediate access to spirometers, including primary care practitioners because of their growing involvement in COPD managment. Early diagnosis can change outcome of disease through smoking cessation and the selective use of a growing body of pharmacologic agents.5The pathogenesis of COPD relates to interaction of a complex array of genetic abnormalities under current study, interacting with environmental factors, most notably smoking, other dusts, and volatile compounds involved in various industries on a worldwide basis. Treatment focuses on eliminating these environmental factors. Oxygen is established as an effective method of increasing not only the length, but quality of life for patients with COPD. 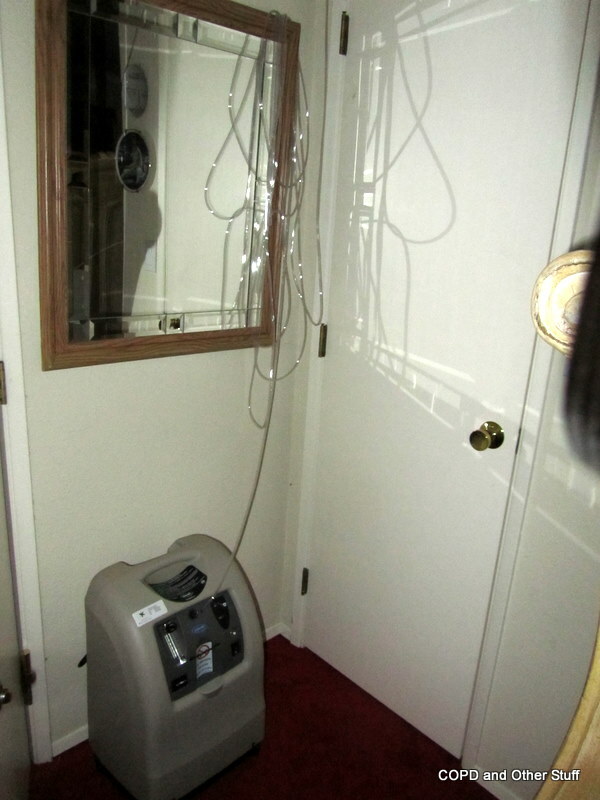 At least 140,000 people with COPD and related disorders benefit from oxygen therapy in the U.S. alone. Ambulatory oxygen systems allow full activity, and they should be equipped with a pulse oximeter in order to monitor therapy’s effectiveness. Portable oxygen concentrators are now approved for air travel. Most weigh about 10 pounds and deliver oxygen only by the demand mode; however, one exception weighs 17 pounds and gives up to 1 to 3 Liters of continuous flow. Pulmonary rehabilitation is established as improving the exercise tolerance of many with COPD. Controlled clinical trials show pulmonary rehabilitation improves depression, anxiety, and somatic preoccupation, which are particularly common in the early stages of disease.7Most pulmonologists can provide the necessary breathing training, assistance in graded exercise, and other components that are key to patient and family education. The future involves increased awareness of COPD among patients, physicians, and other health care providers. COPD is the only disease increasing in morbidity and mortality among the top five killers, and by 2010, it is expected to become the third most common cause of death in the U.S. It resulted in direct and indirect losses of $30.4 billion to the U.S. economy in 2001. Approximately 16 million adult Americans have COPD, and it is very likely that a similar number have asymptomatic or even symptomatic lung disease that is neither diagnosed nor treated. Thomas L. Petty, MD, MACP, Master FCCP, is chairman emeritus of the National Lung Health Education Program, Denver. My next blog post will put money where my mouth is in a challenge to join me to prove that patients educated about their disease/s WILL make whatever lifestyle changes needed for the best health possible.